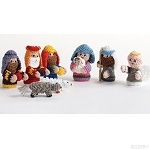 A Mini, colorful nativity scene. Each figure is hand carved and hand painted. Tallest piece is 1.5" Tall.